Rimsky-Korsakov and Taneyev were both distinguished teachers of composition as well as composers—and both benefited from their encounters with Tchaikovsky. Taneyev, a brilliant pianist, was one of Tchaikovsky’s favourite pupils and they remained close friends. In general, the nationalist composers of the Five (or Mighty Handful) had fewer connections with Tchaikovsky, not least because Balakirev was suspicious of his Western training, but Rimsky-Korsakov was something of an exception. He was already teaching composition and orchestration at the St Petersburg Conservatory when he sought Tchaikovsky’s advice about the technical knowledge he needed to acquire. With Rimsky-Korsakov teaching in St Petersburg, and Taneyev in Moscow, the list of their pupils is a veritable roll-call of Russian composers. Rimsky’s pupils included Arensky, Glazunov, Lyadov, Myaskovsky and Stravinsky, while Taneyev taught Scriabin, Rachmaninov, Medtner and Glière. Both became masters of the craft of composition, and their consummate skill is apparent in the works on this album. Sergei Taneyev (1856-1915) does not fit any of the customary stereotypes of Russian composers of his time: unlike the Five and their successors, he had only limited interest in using folk music as a basis for his composition. His tastes were more conservative and more austere than those of his teacher Tchaikovsky: his enthusiasms tended towards Renaissance polyphony and Bachian counterpoint. His approach to composition was meticulous, painstaking, and notable for its elegant command of technique. His outlook was cosmopolitan, and there is little overt ‘nationalism’ is his works. In short, Taneyev represents something of an anomaly among the Russian composers of his time, and this—along with the punctilious restraint that often characterizes his music—may go some way to explaining why his works are not better known. Despite their aesthetic differences, Taneyev maintained friendly relationships with the Five and their pupils. He even followed the example of Balakirev and others and collected some Kabardinian folk songs from the Caucasus in 1885, publishing twenty of them in an article entitled On the music of the mountain Tartars the following year—a publication that was to inspire Prokofiev in 1941 when he composed his second string quartet. But the deeper roots of Taneyev’s style were to be found in the Renaissance and Baroque music he so admired, and in Beethoven, Schumann and Brahms. Taneyev was prodigiously talented as a child, starting piano lessons at the age of five and becoming a student at the Moscow Conservatory before his tenth birthday. In 1871 he began to study composition with Tchaikovsky, and the two went on to become lifelong friends. Taneyev graduated in 1875, and the following year Tchaikovsky dedicated Francesca da Rimini to his brilliant young student. Taneyev was also an outstanding pianist, and the manuscript full score of Tchaikovsky’s first piano concerto (1874-5) has a dedication to Taneyev (who was still a student), which was subsequently changed to Hans von Bülow. Taneyev was the soloist in the first Moscow performance of the concerto (on 21 November / 3 December 1875), conducted by his piano teacher, Nikolai Rubinstein. Taneyev was on friendly terms with Leo Tolstoy and his wife Sonya (Sophia). In the mid-1890s Taneyev spent several summers with the Tolstoys, and was particularly close to Sonya. Tolstoy persuaded Taneyev to take up cycling, something he did with great enthusiasm, claiming that ‘even the experiences of newly-weds on their wedding night cannot compare with the sensations experienced by the bicyclist’. Tolstoy and Taneyev played chess together, and they shared an interest in Esperanto. Taneyev was one of the first Russian speakers of the language and in the mid-1890s he composed songs on Esperanto texts, as well as writing some of his diary entries in Esperanto. Tolstoy eventually became jealous of Sonya’s closeness to Taneyev, though any notion of impropriety was a product of Tolstoy’s imagination: Taneyev never married and throughout his adult life he was looked after by his elderly nanny. Tchaikovsky occasionally chided Taneyev for his unwillingness to take musical risks, and while there is always plenty to admire in the formal design and contrapuntal accomplishment of Taneyev’s music, the ideas themselves are not always striking. Rimsky-Korsakov described Taneyev’s working method in My Musical Life, writing that before starting work on a composition Taneyev ‘used to precede it with a multitude of sketches and studies: he used to write fugues, canons and various contrapuntal interlacings on the individual themes, phrases and ideas’, only then moving on with the composition itself. Rimsky admitted that this kind of preparation could lead to ‘a dry and academic composition, devoid of any shadow of inspiration’, but added that Taneyev’s best music has ‘a wealth of beauty and expressiveness’. Rimsky was referring here to Taneyev’s opera The Oresteia, but his comments could equally have been applied to the best of his chamber music, including the piano quintet, Op 30, of 1910–11, and the slightly earlier piano trio included on this recording. The Piano Trio in D major, Op 22, composed in 1907, shows Taneyev at his most eloquent and individual. 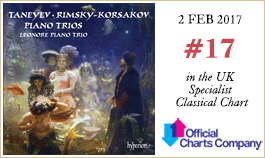 The overall design may owe something to Tchaikovsky’s piano trio (both include ambitious sets of variations), but the musical language is distinctive, harmonically rich and with a sure-footed sense of direction. 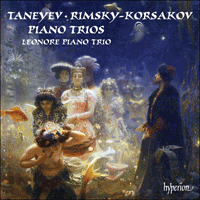 Taneyev’s piano trio is dedicated to the composer Aleksandr Grechaninov (an erstwhile pupil of both Taneyev and Rimsky-Korsakov). The Allegro first movement opens with a bold idea in octaves on the piano, marked by a falling sixth which quickly reappears in the piano’s upper register as the starting point for a more lyrical theme taken up by the strings. As well as its striking main theme, the opening paragraph of this movement reveals the attractive mobility of Taneyev’s harmonies (there’s perhaps a hint of Fauré in places), and his effortless use of imitation and other contrapuntal devices to generate new material and to enrich the texture. While the first themes had a sureness of purpose, the contrasting second group grows more hesitantly, with fragments emerging and gradually coalescing. Given his working methods, it is no surprise to find Taneyev in his element during the development section, a brilliant working-out of the ideas already presented, with a wonderful handling of musical lines, of pacing, and of complex harmonies. In the recapitulation the ideas return in reverse order, with the opening idea only returning at the end to bring the movement to an affirmative conclusion. The second movement is marked Allegro molto. An ambitious scherzo in duple time, it is in D minor, opening with an angular, syncopated tune which gives way to a contrasting idea in which 2/4 and 3/4 time signatures alternate. What follows comes as a surprise: using a theme derived from the opening, Taneyev embarks on a series of eleven short variations that demonstrate his inventiveness and expressive range to powerful effect: by turns, lyrical, whimsical, stern and darkly dramatic, the composer draws every possibility from his theme before returning to the jagged music from the start for an uneasy close. The last two movements are linked. In the Andante espressivo, Taneyev writes ardently emotional music for the violin and cello, starting in F major, but soon moving into far-flung keys in the course of a most expressive duet that is supported for much of the time by gently pulsating chords on the piano. As the strings end their lyrical song, the piano plays a brief, tender interlude, followed by the solo violin which plays a short cadenza leading straight into the finale. Marked Allegro con brio, this opens with a witty theme introduced by the violin which is derived from the same material as the main theme of the third movement, but now given an entirely different character. What follows is another large-scale sonata-form movement in which snatches from earlier in the piece are recalled with gleeful abandon, culminating in a short piano cadenza and an urgent coda in which the grand opening gesture from the very start of the work is just one of the ideas worked into a heady brew of jubilant contrapuntal games. Rimski-Korsakov et Taneïev étaient tous deux d’éminents professeurs de composition, également compositeurs—et tous deux tirèrent profit de leurs rencontres avec Tchaïkovski. Taneïev, brillant pianiste, était l’un des élèves préférés de Tchaïkovski et ils restèrent très bons amis. En général, les compositeurs nationalistes du groupe des Cinq (ou «Puissant petit groupe») eurent moins de relations avec Tchaïkovski, notamment parce que Balakirev se méfiait de sa formation occidentale, mais Rimski-Korsakov fut une sorte d’exception. Il enseignait déjà la composition et l’orchestration au Conservatoire de Saint-Pétersbourg lorsqu’il demanda conseil à Tchaïkovski à propos des connaissances techniques qu’il devait acquérir. Rimski-Korsakov enseignait à Saint-Pétersbourg et Taneïev à Moscou; la liste de leurs élèves est une véritable brochette de compositeurs russes. Au nombre des élèves de Rimski-Korsakov figuraient Arenski, Glazounov, Liadov, Miaskovski et Stravinski, pendant que Taneïev prodiguait son enseignement à Scriabine, Rachmaninov, Medtner et Glière. Ils devinrent tous deux des maîtres dans l’art de la composition et leur parfaite compétence est manifeste dans les œuvres de cet album. Sergueï Taneïev (1856-1915) ne correspond à aucun des stéréotypes habituels des compositeurs russes de son temps: contrairement aux Cinq et à leurs successeurs, il ne portait qu’un intérêt limité à l’utilisation de la musique populaire comme base de ses compositions. Ses goûts étaient plus conservateurs et plus austères que ceux de son professeur Tchaïkovski: ses enthousiasmes tendaient vers la polyphonie de la Renaissance et le contrepoint à la manière de Bach. Son approche de la composition était méticuleuse, minutieuse et remarquable pour son élégante maîtrise de la technique. Sa conception était cosmopolite et l’on trouve peu de «nationalisme» manifeste dans ses œuvres. Bref, Taneïev représente une sorte d’anomalie parmi les compositeurs russes de son temps et ceci—en même temps que la retenue scrupuleuse qui caractérise souvent sa musique—explique peut-être un peu pourquoi ses œuvres ne sont pas mieux connues. Malgré leurs différences esthétiques, Taneïev entretint des relations amicales avec les Cinq et leurs élèves. Il suivit même l’exemple de Balakirev et d’autres compositeurs en recueillant des chansons traditionnelles kabardes du Caucase en 1885, dont il publia une vingtaine l’année suivante dans un article intitulé Sur la musique des Tartares de la montagne—publication qui allait inspirer Prokofiev en 1941 quand il composa son deuxième quatuor à cordes. Mais les racines plus profondes du style de Taneïev sont à trouver dans la musique de la Renaissance et dans la musique baroque qu’il admirait tant, ainsi que chez Beethoven, Schumann et Brahms. Taneïev était un enfant prodigieusement talentueux; il prit ses premières leçons de piano à l’âge de cinq ans et entra au Conservatoire de Moscou avant son dixième anniversaire. En 1871, il commença à étudier la composition avec Tchaïkovski et ces deux-là allaient devenir des amis pour toujours. Taneïev reçut son diplôme en 1875 et, l’année suivante, Tchaïkovski dédia Francesca da Rimini à son brillant étudiant. Taneïev était aussi un remarquable pianiste et la grande partition manuscrite du premier concerto pour piano (1874-75) de Tchaïkovski porte une dédicace à Taneïev (qui était encore étudiant), dédicace qui fut par la suite modifiée en faveur de Hans von Bülow. Taneïev fut le soliste de la première exécution moscovite du concerto (le 21 novembre / 3 décembre 1875), sous la direction de son professeur de piano, Nikolaï Rubinstein. Taneïev entretenait aussi des relations amicales avec Léon Tolstoï et sa femme Sonya (Sophia). Au milieu des années 1890, Taneïev passa plusieurs été avec les Tolstoï et fut particulièrement proche de Sonya. Tolstoï convainquit Taneïev de se mettre au vélo, ce qu’il fit avec beaucoup d’enthousiasme, déclarant que «même les expériences des jeunes mariés lors de leur nuit de noces ne pouvaient se comparer aux sensations ressenties par le cycliste». Tolstoï et Taneïev jouaient ensemble aux échecs et s’intéressaient tous deux à l’Esperanto. Taneïev fut l’un des premiers Russes à parler cette langue et, au milieu des années 1890, il composa des mélodies sur des textes en esperanto et écrivit certaines entrées de son journal intime en esperanto. Tolstoï finit par devenir jaloux de l’intimité entre Sonya et Taneïev, bien que toute notion d’inconvenance ait été le produit de l’imagination de Tolstoï: Taneïev ne se maria jamais et, durant toute sa vie d’adulte, c’est sa vieille nourrice qui s’occupa de lui. De temps en temps, Tchaïkovski grondait Taneïev pour sa réticence à prendre des risques musicaux et, s’il y a toujours beaucoup de choses à admirer dans la conception formelle et l’accomplissement contrapuntique de la musique de Taneïev, les idées elles-mêmes ne sont pas toujours frappantes. Rimski-Korsakov décrivit la méthode de travail de Taneïev dans son Journal de ma vie musicale, écrivant qu’avant de commencer à travailler à une composition, Taneïev «avait l’habitude de la faire précéder d’une multitude d’esquisses et d’études: il avait l’habitude d’écrire des fugues, des canons et divers entrelacements contrapuntiques sur des thèmes, des phrases et des idées séparés», ne passant qu’après ça à la composition elle-même. Rimski admettait que ce genre de préparation pouvait conduire à «une composition sèche et académique, dépourvue de la moindre trace d’inspiration», mais ajouta que la meilleure musique de Taneïev présente «une mine de beauté de force expressive». Rimski faisait ici référence à l’opéra de Taneïev L’Orestie, mais ses remarques auraient également pu s’appliquer à ses meilleures œuvres de musique de chambre, notamment au quintette avec piano, op.30, de 1910–11, et au trio avec piano légèrement antérieur enregistré ici. Le Trio avec piano en ré majeur, op.22, composé en 1907, montre la face la plus éloquente et personnelle de Taneïev. La conception d’ensemble doit peut-être quelque chose au trio avec piano de Tchaïkovski (ils contiennent tous deux des variations ambitieuses), mais le langage musical est distinctif, riche sur le plan harmonique et avec un sens agile de la direction. Le trio avec piano de Taneïev est dédié au compositeur Alexandre Gretchaninov (un ancien élève de Taneïev comme de Rimski-Korsakov). Le premier mouvement Allegro débute avec une idée audacieuse en octaves au piano, marquée par une sixte descendante qui réapparaît bientôt dans le registre supérieur du piano comme point de départ d’un thème plus lyrique repris par les cordes. Tout comme son thème principal frappant, le premier paragraphe de ce mouvement révèle la mobilité attrayante des harmonies de Taneïev (il y a peut-être une allusion à Fauré en certains endroits), et son utilisation naturelle de l’imitation et d’autres procédés contrapuntiques pour engendrer un matériel nouveau et enrichir la texture. Si les premiers thèmes avaient un objectif sûr, le second groupe contrasté est plus hésitant, certains fragments émergeant et s’unissant peu à peu. Étant donné ses méthodes de travail, il n’est pas surprenant que ce soit dans le développement que l’on trouve Taneïev dans son élément, une brillante élaboration des idées déjà présentées, avec un merveilleux maniement des lignes musicales, du rythme et des harmonies complexes. À la réexposition, les idées reviennent en ordre inverse, l’idée initiale ne réapparaissant qu’à la fin pour amener le mouvement à une conclusion affirmative. Le deuxième mouvement est marqué Allegro molto. Un scherzo ambitieux à deux temps en ré mineur, commençant par un air syncopé et saccadé qui fait place à une idée contrastée où alternent les mesures à 2/4 et 3/4. Ce qui suit arrive comme une surprise: sur un thème dérivé du début, Taneïev se lance dans une série de onze courtes variations qui démontrent son esprit inventif et son étendue expressive avec beaucoup d’effet: tour à tour lyriques, fantasques, graves et sinistrement dramatiques, le compositeur tire toutes les possibilités de son thème avant de retourner à la musique dentelée du début pour une conclusion difficile. Les deux derniers mouvements s’enchaînent. Dans l’Andante espressivo, Taneïev écrit une musique passionnément émouvante pour le violon et le violoncelle, qui débute en fa majeur, mais part vite dans des tonalités éloignées au cours d’un duo très expressif soutenu la majeure partie du temps par des accords au piano formant une douce pulsation. Après le chant lyrique des cordes, le piano se voit confier un bref et tendre interlude, suivi par une courte cadence du violon seul menant tout droit au finale. Marqué Allegro con brio, il commence par un thème plein d’esprit introduit par le violon qui provient du même matériel que le thème principal du troisième mouvement, mais avec maintenant un caractère totalement différent. Vient ensuite un autre mouvement de forme sonate de grande envergure où des fragments de ce qui a précédé dans le trio refont surface avec un joyeux abandon, culminant dans une courte cadence du piano et une coda pressante où le geste initial grandiose du tout début de l’œuvre n’est que l’une des idées exploitées dans un mélange grisant de jeux contrapuntiques d’une joie débordante. Rimskij-Korsakow und Tanejew waren beide sowohl angesehene Kompositionslehrer als auch Komponisten—und beide profitierten von ihrem Kontakt mit Tschaikowsky. Tanejew, ein brillanter Pianist, war ein Lieblingsschüler Tschaikowskys und die beiden Musiker blieben zeitlebens eng befreundet. Generell pflegten die nationalistisch gesinnten Komponisten der Gruppe der Fünf (auch das mächtige Häuflein genannt) kaum Umgang mit Tschaikowsky, nicht zuletzt, weil Balakirew der westlichen Musikausbildung Tschaikowskys kritisch gegenüberstand, doch bildete Rimskij-Korsakow eine gewisse Ausnahme. Er lehrte bereits Komposition und Orchestrierung am St. Petersburger Konservatorium, als er Tschaikowsky um Rat in musiktechnischen Fragen bat. Tanejew lehrte in Moskau, so dass praktisch alle russischen Komponisten der nächsten Generationen bei einem der beiden ausgebildet wurden. Zu Rimskij-Korsakows Schülern zählten Arensky, Glasunow, Ljadow, Mjaskowsky und Strawinsky, während Tanejew Skrjabin, Rachmaninow, Medtner und Glière unterrichtete. Beide wurden wahre Meister der Kompositionskunst und ihre vollendete Fertigkeit wird in den hier vorliegenden Werken deutlich. Sergej Tanejew (1856-1915) passt in keines der gewohnten Raster russischer Komponisten seiner Zeit: im Gegensatz zu der Gruppe der Fünf und ihren Nachfolgern war er an Volksmusik als Kompositionsgrundlage nur begrenzt interessiert. Sein Geschmack war insgesamt eher konservativ und genügsamer als der seines Lehrers Tschaikowsky: er begeisterte sich eher für die Polyphonie der Renaissance oder den Bach’schen Kontrapunkt. Sein Kompositionsansatz war sorgfältig, gewissenhaft und bekannt für seine elegante Beherrschung der Technik. Er hatte eine kosmopolitische Perspektive und es findet sich kaum offensichtlicher „Nationalismus“ in seinen Werken. Kurz gesagt bildet Tanejew unter den russischen Komponisten seiner Zeit eine Ausnahme, was möglicherweise—neben der förmlichen Zurückhaltung, die seine Werke oft charakterisiert—mit erklärt, weshalb seine Werke nicht bekannter sind. Trotz ihrer ästhetischen Differenzen pflegte Tanejew freundlichen Kontakt mit den Fünf und ihren Schülern. Er folgte sogar dem Beispiel von Balakirew und anderen, indem er 1885 im Kaukasus einige kabardinische Volkslieder sammelte. Im folgenden Jahr gab er zwanzig davon in einem Artikel mit dem Titel Über die Musik der Berg-Tataren heraus—diese Publikation sollte Prokofjew 1941 als Inspirationsquelle dienen, als er sein zweites Streichquartett komponierte. Die tieferen Wurzeln von Tanejews Stil fanden sich jedoch in der Musik der Renaissance und des Barock, die er so verehrte, sowie in den Werken von Beethoven, Schumann und Brahms. Tanejew zeigte bereits als Kind besonderes Talent—im Alter von fünf Jahren erhielt er seine ersten Klavierstunden und wurde noch vor seinem 10. Geburtstag ein Student des Moskauer Konservatoriums. 1871 begann er, bei Tschaikowsky Komposition zu studieren, woraufhin sich eine lebensbegleitende Freundschaft zwischen den beiden entwickelte. Tanejew schloss 1875 sein Studium ab und im folgenden Jahr widmete Tschaikowsky seinem brillanten jungen Schüler die symphonische Dichtung Francesca da Rimini. Tanejew war zudem ein hervorragender Pianist und das Partitur-Manuskript des ersten Klavierkonzerts von Tschaikowsky (1874-75) enthält eine Widmung an Tanejew (der zu dem Zeitpunkt noch studierte), die jedoch später Hans von Bülow galt. Tanejew übernahm aber den Solopart in der ersten Moskauer Aufführung des Konzerts (am 21. November / 3. Dezember 1875) unter der Leitung seines Klavierlehrers Nikolai Rubinstein. Tanejew war mit Leo Tolstoi und dessen Frau Sonja (Sofia) befreundet. Mitte der 1890er Jahre verbrachte Tanejew mehrere Sommer zusammen mit den Tolstois und stand Sonja besonders nahe. Tolstoi überzeugte Tanejew davon, das Fahrradfahren aufzunehmen, was er selbst mit großer Begeisterung pflegte und erklärte, dass „selbst die Erfahrungen eines Brautpaars in der Hochzeitsnacht sich nicht mit den Empfindungen eines Fahrradfahrers vergleichen lassen“. Tolstoi und Tanejew spielten Schach zusammen und waren beide an Esperanto interessiert. Tanejew erlernte diese Sprache als einer der ersten in Russland; Mitte der 1890er Jahre komponierte er Lieder mit Esperanto-Texten und verfasste auch einige seiner Tagebucheinträge auf Esperanto. Tolstoi wurde schließlich auf die enge Beziehung zwischen Sonja und Tanejew eifersüchtig, obwohl jeglicher Eindruck von Unschicklichkeit ein Produkt von Tolstois Einbildung war: Tanejew heiratete nie und wurde durch sein gesamtes Erwachsenenleben hinweg von seinem ältlichen Kinderfräulein umsorgt. Tschaikowsky tadelte Tanejew gelegentlich für seine Abneigung gegen musikalische Risiken: zwar findet sich stets reichlich Bewundernswertes in der formalen Anlage und Kontrapunktik der Musik Tanejews, doch sind die musikalischen Ideen selbst nicht immer hervorstechend. Rimskij-Korsakow schilderte Tanejews Arbeitsmethode in der Chronik meines musikalischen Lebens, wo er schrieb, dass Tanejew „eine Vielzahl von Skizzen und Studien anfertigte: er schrieb Fugen, Kanons und diverse kontrapunktische Verschlingungen über die jeweiligen Themen, Phrasen und Ideen“, bevor er sich der Komposition des neuen Werks selbst widmete. Rimskij-Korsakow räumte ein, dass eine derartige Vorbereitung zu „trockenen und akademischen Kompositionen“ führen konnte, denen „jeglicher Anflug von Inspiration abging“, fügte jedoch hinzu, dass Tanejews beste Musik „eine Fülle von Schönheit und Expressivität“ besitzt. Dabei bezog Rimskij-Korsakow sich auf Tanejews Oper Oresteia, doch ist dieser Kommentar ebenso gültig für seine besten Kammermusik-Werke wie etwa das Klavierquintett op. 30 (von 1910/11) und das etwas früher entstandene, hier vorliegende Klaviertrio. Das Klaviertrio in D-Dur, op. 22, entstand 1907 und zeigt Tanejew von seiner ausdrucksvollsten und individuellsten Seite. Die Gesamtanlage mag sich auf Tschaikowskys Klaviertrio beziehen (beide enthalten anspruchsvolle Variationen), doch der musikalische Ausdruck ist unverwechselbar, harmonisch reichhaltig und das Werk zeigt einen selbstsicheren Orientierungssinn. Tanejews Klaviertrio ist dem Komponisten Alexander Gretschaninow gewidmet (ein ehemaliger Schüler, der auch bei Rimskij-Korsakow studiert hatte). Das eröffnende Allegro beginnt mit einer kühnen Idee in Oktaven vom Klavier, die sich durch eine fallende Sexte auszeichnet, welche bald im oberen Register des Klaviers erscheint und dort den Ausgangspunkt eines eher lyrischen Themas bildet, welches von den Streichern aufgenommen wird. Ebenso wie das bemerkenswerte Hauptthema offenbart der Beginn dieses Satzes die reizvolle Mobilität der Tanejew’schen Harmonien (was zuweilen vielleicht an Fauré erinnert) und seinen mühelosen Einsatz von Imitation und anderen kontrapunktischen Kunstgriffen, mit denen neues Material erzeugt und die bestehende Struktur bereichert wird. Während die ersten Themen zielstrebig auftreten, entsteht die zweite Themengruppe eher zögerlich—Fragmente treten hervor und wachsen nach und nach zusammen. Wenn man seine Arbeitstechnik bedenkt, so ist es kaum überraschend, dass Tanejew in der Durchführung völlig in seinem Element ist; eine brillante Ausarbeitung der bereits dargestellten Themen mit wunderbarer Stimmführung, Koordination und Handhabung komplexer Harmonien. In der Reprise kehren die Ideen in umgekehrter Reihenfolge wieder und das Eröffnungsthema erklingt erst ganz am Ende, um den Satz mit Bestimmtheit abzuschließen. Der zweite Satz ist mit Allegro molto bezeichnet. Es handelt sich dabei um ein anspruchsvolles Scherzo in d-Moll, welches in einer geraden Taktart steht und mit einer eckigen, synkopierten Melodie beginnt, die dann einem kontrastierenden Thema weicht, in dem ein Zweivierteltakt mit einem Dreivierteltakt alterniert. Darauf folgt eine Überraschung: über ein Thema, das mit der Anfangsmelodie verwandt ist, komponiert Tanejew elf kurze Variationen, die seinen Erfindungsreichtum und seine Ausdruckskraft wirkungsvoll demonstrieren. Indem er sie abwechselnd lyrisch, skurril, streng und düster-dramatisch gestaltet, entlockt er seinem Thema alles Potenzial, bevor er zu der zerklüfteten Musik des Beginns zurückkehrt und damit zu einem unbehaglichen Ende kommt. Die letzten beiden Sätze sind miteinander verknüpft. In dem Andante espressivo schreibt Tanejew leidenschaftliche Musik für Geige und Cello, die in F-Dur beginnt, sich allerdings schon bald in weit entlegene Tonarten bewegt, während sich ein äußerst expressives Duett entwickelt, das vom Klavier zumeist mit sanft pulsierenden Akkorden begleitet wird. Wenn die Streicher ihr lyrisches Lied beenden, spielt das Klavier ein kurzes, sanftes Zwischenspiel, woraufhin die Geige mit einer Solokadenz direkt in das Finale hinüberleitet. Dieses ist mit Allegro con brio überschrieben und beginnt mit einem geistreichen Thema, das von der Geige vorgestellt wird und von demselben Material wie das Hauptthema des dritten Satzes abstammt, hier jedoch einen völlig anderen Charakter annimmt. Es folgt ein großangelegter Satz in Sonatenform, in dem Schnipsel aus dem früheren Trio mit Hingabe ausgekostet werden. Den Höhepunkt bildet eine kurze Klavierkadenz und eine drängende Coda, in der die großartige Geste vom Beginn des Werks nur eins von mehreren Motiven ist, die in eine berauschende Mischung triumphierender kontrapunktischer Spiele eingeflochten sind.